Applicable Projects: The Hamilton County Soil and Water Conservation Districts reviews the Storm Water Pollution Prevention Plan for construction projects that exceed one acre and are owned by Carmel, Fishers, Westfield, Noblesville, Cicero, Arcadia or Hamilton County. Through agreement, we also review plans for all projects within the town limits of Sheridan and Arcadia. Submission Guidelines: A digital copy of the Stormwater Pollution Prevention Plan (SWPPP) must be submitted below. Submissions must include name, address, email address and phone number of the contact person for question pertaining to the plan. Hard copy of quarter sheets may also be submitted directly to our office. Size: Digital copies of plans are preferred. Files must not exceed 20MB, but can be separated into multiple files. Hard copies of quarter sheets (11” x 17”) are preferred to full size sheets. Additional narrative documentation can be on standard letter size. Plan Review Process: Plans are reviewed in order that they are received. The Rule provides 28 days for review. We will attempt to provide review in two weeks. The Standard Technical Review and Comment Form will be emailed to the contact person with any comments. If you have questions about the review, contact Ginger Davis. It can be advantageous for the designer and reviewer to meet and discuss a plan- especially complex ones. This meeting can take place before or after submission. Revisions: If revised plans need to be submitted, please submit only those sheets that have been changed. These can be submitted digitally in pdf format or hard copy. Contact Ginger Davis for best delivery method for re-submissions. Sediment is the #1 pollutant in Indiana waters! Rule 5 compliance helps keep our water clean and clear! 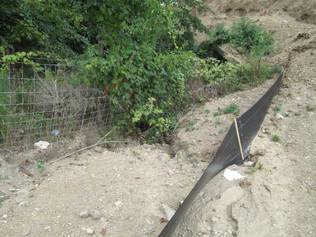 The photo above shows poor erosion control. From the IDEM Website: 327 IAC 15-5 (Rule 5) " is a performance-based regulation designed to reduce pollutants that are associated with construction and/or land disturbing activities. The requirements of Rule 5 now apply to all persons who are involved in construction activity (which includes clearing, grading, excavation and other land disturbing activities) that results in the disturbance of one (1) acre or more of total land area. If the land disturbing activity results in the disturbance of less than one (1) acre of total land area, but is part of a larger common plan of development or sale, the project is still subject to storm water permitting. " The Hamilton County Soil and Water Conservation Districts reviews the Storm Water Pollution Prevention Plan for construction projects that exceed one acre and are owned by Carmel, Fishers, Westfield, Noblesville, Cicero, Arcadia or Hamilton County. Through agreement, we also review plans for all projects within the town limits of Sheridan and Arcadia. IDEM Rule 5 forms are accessible here. This office reviews primarily MS4 entity owned project. Please pick the MS4 affiliation. If project is within the Towns of Sheridan or Arcadia- FIll in Other Project Owner with project owner name. Most owners are listed Project Owner Affiliation drop down. If your owner is not listed, please indicate name of owner here. Documents cannot exceed 20MB in size. Large files and be separated into multiple files. If additional file space is required, please submit this form with a transmission page and make note in comment field or contact soil.water@hamiltoncounty.in.gov for guidance. Upload SWPPP documents for submission here. Questions? -Call the office (317) 773-2181.